DescriptionThis is an unusual, unique item. 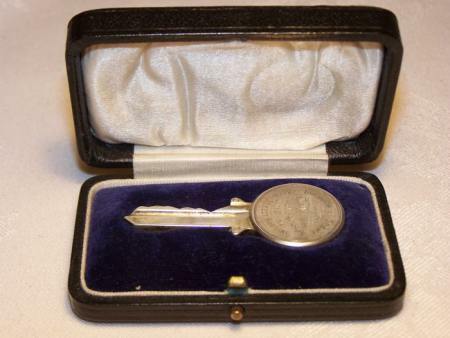 A solid silver, fully hallmarked presentation key in its original presentation box (which is in excellent condition). Dated with the inscription "Borough of Crewe, presented to the Mayoress, Mrs DM Jackson, Alton Street Housing, June 27 1924. With a good weight at 18g, it measures 2.2/8" inch in the form of a standard key. Assayed in Birmingham 1923 (y) with makers mark for James Fenton. A nice, novelty piece. Please do not hesitate to email or call for more details of this special piece. Free International Shipping & Insurance. DimensionsWeight 18g Length 2.2/8" Date1923 ConditionExcellent A1 Price£ 90.00 Price Includes Worldwide Packaging, Delivery & Insurance.